Noble House was one of the last great mini-series to air during the dozen-year term when the format was at the pinnacle of network viewing. From 1977’s Roots to the late 1980s, the mini-series grabbed phenomenal ratings as it brought viewers back night-after-night over a short period. Of the numerous mini-series produced during this era, only a few are remembered today: Roots, Shogun, The Thorn Birds, The Winds of War, War and Remembrance, and Noble House. The success of Shogun led directly to Noble House, although it took seven years to get the production of the latter off the ground. Shogun’s mammoth ratings and unanimous critical praise made producers eager to send another James Clavell novel into the pipeline. Once Noble House was chosen, the struggles began. Chief among them was winnowing the 1000-page novel into a workable length. Even accorded six hours of screen time, there was too much material in the source to go into the teleplay without considerable condensation. To give him his due, Eric Bercovici (who also adapted Shogun) did yeoman’s work. Although there are missteps, he captured the essences of the major characters, simplified and clarified the complex workings of the twisted economic gamesmanship, and added a little romance where there was none in the book. Clavell, who was involved in the creative process, was satisfied with the result and the mini-series delivered good (although not blockbuster-level) ratings for NBC. Not surprisingly, the story is long and complicated. 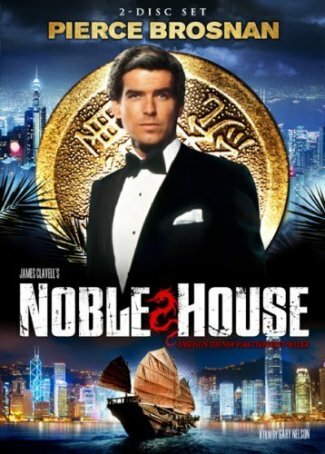 Noble House unfolds in Hong Kong less than a decade prior to the territory’s return to China (a future event that plays a role despite not being a plot point in the book, which was set 25 years earlier). Ian Dunross (Brosnan), the new Tai-Pan of Straun’s International Trading Company (a.k.a. “The Noble House”), wrestles to stabilize the corporation’s shaky financial standing by seeking a partnership with American Linc Bartlett (Masters) while blocking his rival, Quillian Gornt (Rhys-Davies). As Bartlett plays off the two CEOs against one another, Dunross embarks on a romance with Bartlett’s vice-president, Casey Tcholok (Raffin). Meanwhile, Bartlett becomes involved with Orlanda Ramos (Julia Nickson), Gornt’s ex-lover. Other subplots brew as the main narrative moves forward. These include a half-coin that gives its bearer influence with the Noble House Tai-Pan, a Hong Kong police officer who may or may not be a spy for China, and a gangster, Four Finger Wu (Khigh Dhiegh), whose offer of financial salvation to Dunross comes with a heavy price: using Straun’s shipping fleet to transport opium. Perhaps strangely, the part of the sudsy Noble House that proves the most compelling is the financial one. The double-crosses, moves and counter-moves, and eventual resolution play out surprisingly well in a visual medium. There’s ample tension and suspense about how everything will resolve as the balance of power shifts and sways between Dunross and Gourt, with Bartlett in the middle seeking to profit from whatever happens. Less successful are the more traditional “action/adventure” aspects and the soap opera-tinged elements. An escape from an inferno on a floating restaurant is competently filmed but not as exciting as one might expect. The climax, which features a massive landslide that topples a building, is hamstrung by budgetary constraints and ‘80s special effects limitations. The disaster images look fake (borderline cheesy) and the scenes of Brosnan and Rhys-Davies clambering around in the wreckage were clearly done in a studio. This, however, is the only sequence when Noble House looks like a made-for-TV production rather than a theatrical feature. For the most part, production values are high. Thirty years after it aired, Noble House holds up well, although cultural shifts since 1988 may change the way a current viewer evaluates aspects of the story. Casey is every bit the strong, “modern” woman but Orlanda comes across like a damsel in distress who needs a man to complete her. There’s an interlude on Gaunt’s boat, in which he makes unwanted advances toward Casey, that put me in mind of Harvey Weinstein. That scene, which was ugly when it aired, is more difficult to watch today, and destroys any appeal that Rhys-Davies brings to the character. The biggest drawback of watching the entire production as a single piece rather than over four consecutive nights is that the unevenness of the pacing becomes evident. At least one of the subplots (involving the potential double-agent police officer) is poorly connected to the rest of the story and there are some dead-end secondary storylines. Nevertheless, the production as a whole is involving and keeps one watching. It lacks the emotional power and romantic appeal of Shogun, but the two are very different stories. Noble House wasn’t the greatest, grandest, or most exotic of the great TV mini-series but it remains a competent and compelling alternative to those who are intimidated by the length of Clavell’s novel. It’s also a good match for anyone in search of something to “binge watch” from a time long before that phrase was ever used for productions of this length.